My mom has been cleaning out her house and has been sending me a lot of my old things as a result. Among those things were some of my old dolls from when I was a girl. My daughter spied them in my closet and asked if we could play with them sometime. I was kind of surprised since my daughter has never really been into dolls. I decided that if we were going to play with dolls we would go all out. 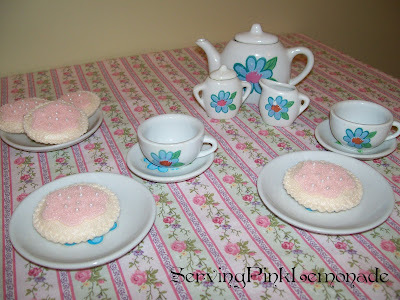 I pulled out my old tea set from when I was a girl, got out the dolls and we had our very first little tea party. My daughter had so much fun! She loved it so much that we had about ten tea parties that day and went through about half a box of Nilla Waffers. I quickly decided that if we were going to be having this many tea parties we were going to need a more permanent cookie. I came up with these tasty looking sugar cookies made out of felt. To make one cookie first cut out two of the large circle in off-white felt. 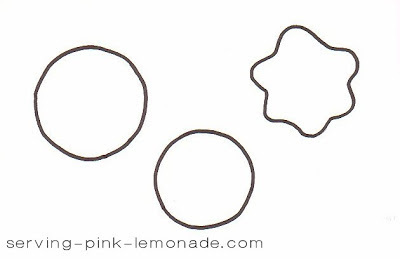 Then cut out the batting using the smaller circle and sandwich the felt on either side of the batting. Next I used my sewing machine and did a zig-zag stitch all the way around. Don't have a sewing machine? Don't worry. You can simply hand sew around it or do a blanket stitch if you know how. To finish it off I cut out the frosting in pink, glued it on and then glued the beads on top for sprinkles. 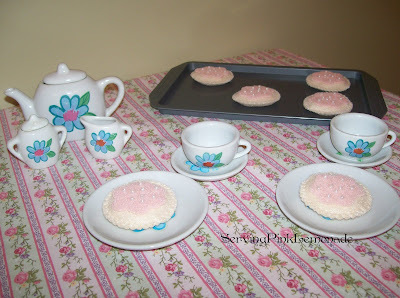 Now we always have cookies on hand for a spur of the moment tea party! SO CUTE! They don't seem that hard to make either. I should give it a try. What a cute Valentines Day Present that would be for B's friend! They are gorgeous so I thought I'd give it a go even though I'd never made or sewn anything before... I had fun!